It’s almost hard to imagine bustling Germantown Avenue being the foggy, smoke-filled scene of revolution that it was in 1777. Yet on Oct. 3, 2010, muskets again were ablaze and thundering cannons shook the nearly 1,000 people estimated to be in attendance to witness the reenactment of the Battle of Germantown at Cliveden. Reenactments are a hobby for the hundred or so actors hailing from all parts of the country comprising the Continental and British armies. Many of their families were also wearing the authentic wardrobes, upholding the lifestyle of 1777 in America for those in attendance. While mostly men were out reenacting the fight (a few women and children participated in the fight reenactment as well,) women were seen sewing, cooking or otherwise depicting 18th century culture. Their children were also running around with toy munitions and play fighting in head-to-toe American Revolution garb. Some were enjoying games like graces, in which a ring is caught and thrown with a stick, a far cry from the modern gaming of a Playstation, yet the kids still seemed to be having genuine fun. Ordinarily these are students, school teachers, home makers or bank managers, but today they were George Washington’s army opposing General Howe’s men, fighting the Battle of Germantown. With cries of “Liberty!” and “For Thomas Paine!” they fired real muskets and cannons, without ammunition of course, but with black powder charges for the big booms and the huge plumes of smoke that covered the battlefield. Rebels and Redcoats in full regalia were once again fighting to uphold a piece of American history; some of Cliveden’s walls are even still pockmarked with Revolutionary-era musket fire. This reality wasn’t lost in the crowd. For an hour on this foggy Saturday morning, very much like the conditions in 1777, it was common to see a genuine balk or two by spectators as a line of muskets were fired in their direction or at the booming canon repercussions. 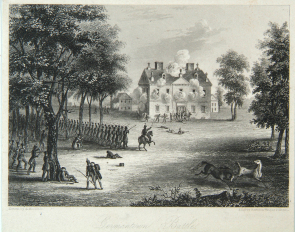 The only battle to take place inside Philadelphia borders during the American Revolution, the Battle of Germantown saw American forces pushing the British back along Germantown Avenue and into Cliveden, then owned by the British Loyalist Chew family. The Chew estate held the property at Germantown Avenue and Cliveden Street, until turning it into the historical site that it is today in 1973. 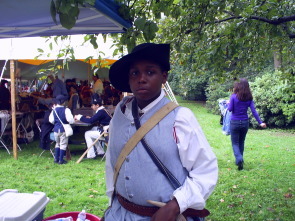 For over 30 years, Cliveden has held reenactments on its grounds. As long as they have been hosting the events, Betty Shellenberger has been there. She was one of the first tour guides when Cliveden was transformed into a museum. Tom McGuire, a historian and the author of "The Surprise at Germantown," narrated a version of the battle from the front of the historic building. 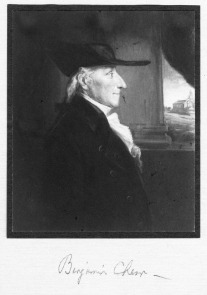 He described an early morning fog, as Washington’s forces pushed down Germantown Avenue, once the Lenni Lenape Trail, surprising the British with the first outright attack on the superior force. In response to the massacre at Paoli, the British knew they were to be shown no quarter and they would have to fight until the last man. Holding Cliveden was important, as it was an outpost for the British. Eventually the Americans, showing more might than they ever had in battle, pushed the British back into Cliveden. Initially the Americans were firing at an angle, but then they were ordered to swing around and concentrate fire on one side of the bulding, which happened to be the front; the heavy stone fascia (wall) better withstood the barrage than would have the rubble and mortar mixture of the building’s sides. McGuire speculated that the building likely would have been toppled if the Americans had focused on those walls. Despite the Continental Army's successes in the fight, there were mishaps. Washington technically lost the battle. Overnight, rum was issued with the rations and perhaps some of the troops were inebriated. One officer faced a court martial for being so. According to Washington, an hour later when reinforcements were rolling in from behind Cliveden, they began firing, not on the house, but in the dense fog and smoky battle, over the house and into their comrades’ lines. The American army in the front stated they were sure that the British had cannons inside the house but it is more likely that is was a case of “friendly fire” from the support coming from the rear of the home. One instance that brings a rise to everyone in attendance is when, after a few futile charges by the Americans, a clergyman is sent with a white flag to offer negotiations and he is shot dead. It is debated whether the British intentionally did so or, if lost in the fog and smoke of the battlefield, he was killed in the turmoil of the fight, but it is recorded that one such minister lost his life on that day. With the fog, the drunken general, and the superior opposing forces, the Continental soldiers lost the Battle of Germantown. It was not all a loss as the Americans earned a moral victory. This was the first time that the inferior American forces orchestrated complex and effective battle maneuvers that displayed that they could impose their might and tenacity against the British Empire and defy their image as a motley bunch of farmers with aimless muskets. Groups such as the 1st Continental Brigade, the 1st Pennsylvania Regiment, 1st New Jersey, and the 6th Maryland Regiment, among others, filled the battle lines and performed the reenactment. These same groups do reenactments across the country with major events in Williamsburg, Virginia and Fort Federick in Big Pool, Maryland. There is a historic reenactment “season” which occurs from April through December. 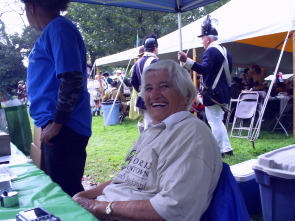 Marilynn Hutchinson, an elementary school teacher, is the matriarch of three generations at the festival. Her daughter met her husband at one reenactment and both of their sons were participating. Hutchinson said that her involvement stemmed from her love of scouting and camping with a bare minimum of supplies. She saw a reenactment at a park on one trip and felt that the hobby echoed her sentiments for a simpler existence. She said it was an outlet to express her minimalist ideals and offered a connection to a long American history in her family. 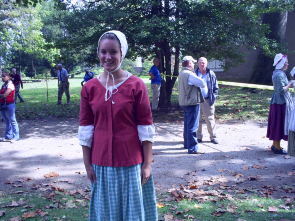 Emily Reinhart of Pottstown, Pa., donned in a Revolution-era dress and bonnet, was in her first reenactment. She decided to partake in the event with her boyfriend, Jake Preston, 16, who is an aspiring history teacher. She said Jake has been doing it as long as he’s been alive and it is a family tradition, and she knew he was heavily into reenacting before they became involved. Peterson was part of the 1st Rhode Island regiment featuring all African-Americans. He participates in Civil and Revolutionary War reenactments, largely on his own volition. An often overlooked aspect of history was that African Americans did participate in the American Revolution. Edward “Ned’ Hector is a Revolutionary War hero; he was among a group of freed men that fought as one of many African-American “teamsters” who moved cargo to strategic positions. Hector was one of a handful of bombardiers who fired the cannons. Hector once, defying orders, did not retreat and abandon his wagon but managed to maintain his position while saving his wagon in addition to collecting discarded weaponry. He was honored with a street named for him in Conshohocken, and today Noah Lewis works to share Hector’s story with America by assuming his character during reenactments and visiting schools and other local events. Visit www.nedhector.com for more information. Documents were recently discovered, reported by the Philadelphia Tribune, implicating the Chew Family, one of the wealthiest in America in the 18th century, as being involved in the slave trade throughout the colonies, and that is a part of Chew history yet to be preserved. Still in 1688, when many of the first slaves were being acquired in Germantown, Francis Daniel Pastorius, lawyer and the first mayor of Germantown, authored the Germantown Petition, objecting to “trafficking mensbody” while declaring the equal treatment for all “generation, descent and colour.” The document, today, is considered a prologue to the abolitionist movement. In light of the Liberty Bell, City Hall and all the history in downtown Philadelphia, Cliveden is among a cadre of historical sites often overlooked throughout the city. Grumblethorpe, the Germantown Whitehouse, Stenton, Wyck and the Germantown Historical Society all offer a piece of American history inside Germantown. Freedom’s Backyard is an organization that aims to change that. Visit freedomsbackyard.com for more information and to purchase a passport to access 14 historical sites in the area up to one year after the purchase date for only $15. The Cliveden museum grounds are open to the public April through December, Thursday through Sunday, from noon to 4 p.m. and a gift shop is available. University's Multimedia Urban Reporting Lab, and originally published on October 9, 2009. Chew family. Papers, 1659-1986 (Collection 2050), The Historical Society of Pennsylvania.